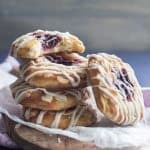 If you’re in search of a unique and seasonal brunch treat that’s extra special, look no further than this incredible Danish pastry recipe! 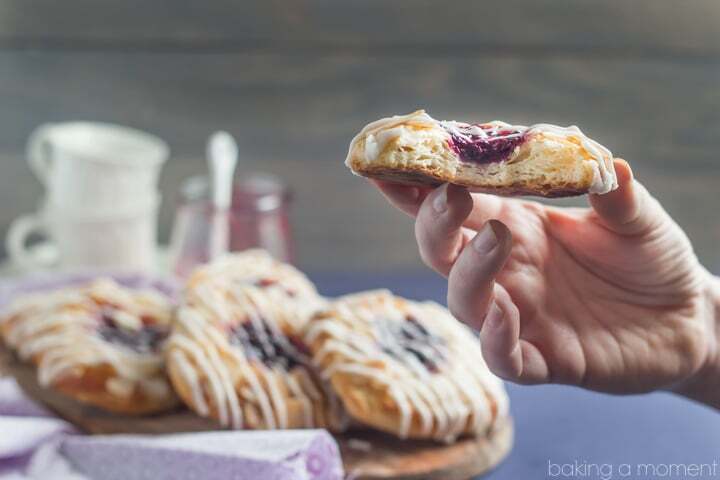 The blackberry ginger filling is an explosion of summer flavors- you’ll want to eat it with a spoon! Crunchy toasted almonds and a sweet vanilla bean glaze are like the icing on the cake! Hoo, guys. I’m tired. I’ve got about 10 minutes to write this out before I’m on to the next thing. It’s been a crazy day. After the kids were off to school I had about a hot second to drizzle icing on these babies and then I had to go meet my younger son’s kindergarten class at a local pond. I don’t know what the heck I was thinking, but when I heard it was a fishing trip, it somehow did NOT occur to me that I would be expected to touch things like worms, algae, and actual fish. I am the biggest sissy on the planet. Luckily there were plenty of actual adults on hand to help out. On the drive home I started feeling that old familiar afternoon slump. Maybe it was the heat that got to me but I just really felt like I needed a pick-me-up so I stopped at Starbucks to check out that s’mores frap everyone’s been buzzing about. Wowza! It most definitely provided that caffeine and sugar high that I was looking for. It got me through the picture taking and editing, but now that’s done and I’m crashing and burning once again. zzzzzz…..
Welp, I’ve still got a little league game plus homework and baths before I can chill. But before I get on with that I want to tell you about these bad boys. Dude. The filling! I am telling you. Insane. Go get yourself some blackberries, immediately, and make this filling. If you make nothing else from this post, just make the filling. Spread it on buttered bread or spoon it over ice cream. It is the best thing I have tasted in a long time, and I taste a lot of really good things. It only takes about 15 minutes to toss the fresh blackberries in sugar and cornstarch, add a little water and some lemon, and a fat pinch of this lightly dried ginger. This is a new product and I just loved it. The combination of blackberries and ginger is definitely a winner. Just look how airy and light! Do you see all those flaky layers? Incredible. And those crunchy toasted almonds, with the vanilla bean glaze…! 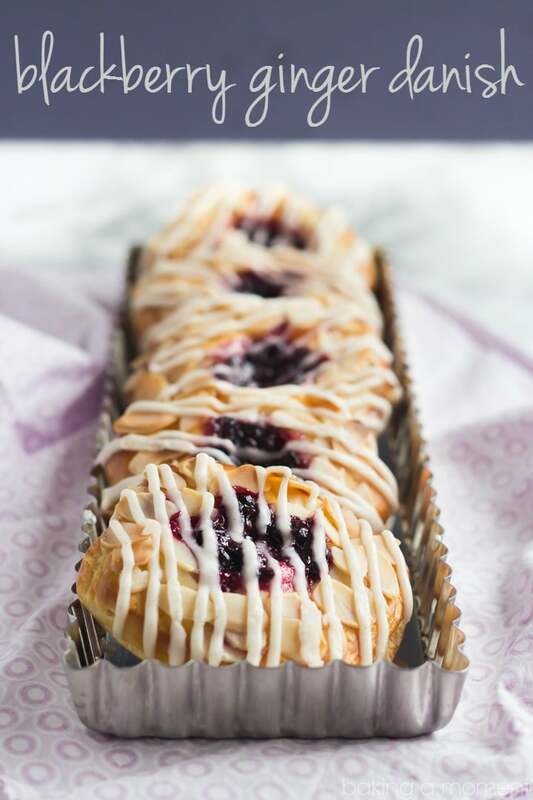 These blackberry ginger Danish + a cup of coffee = pure bliss. Hope you have a fun and restful weekend! 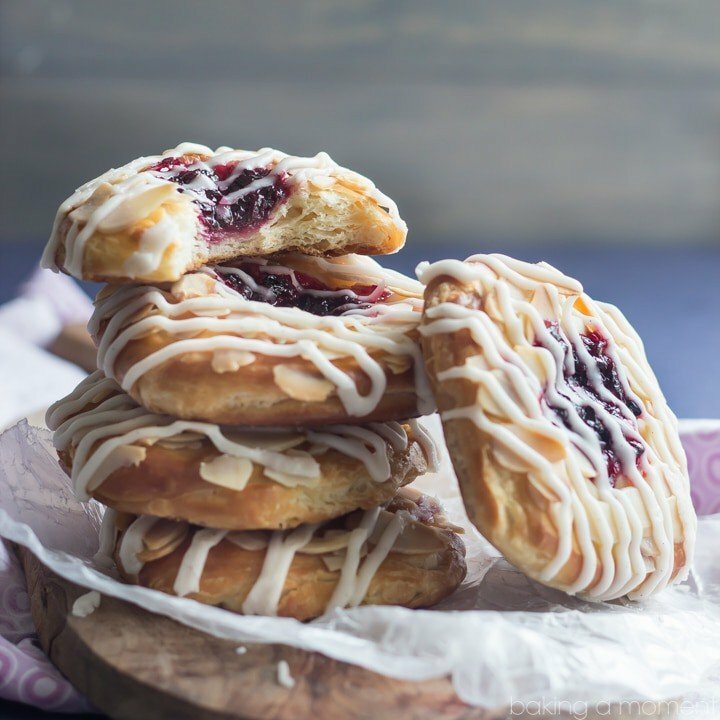 If you're in search of a unique and seasonal brunch treat that's extra special, look no further than this incredible Danish pastry recipe! The blackberry ginger filling is an explosion of summer flavors- you'll want to eat it with a spoon! Crunchy toasted almonds and a sweet vanilla bean glaze are like the icing on the cake! Place the berries, sugar, and cornstarch in a small pot and toss to combine. Add the ginger, lemon juice, and water, and cook over medium-high heat until syrup-y and thick, and most of the berries have broken apart but some chunks still remain (approx. 10-15 minutes). Cut the dough into three equal portions. Cut each third in half, and then cut each half into thirds. You should have 18 equal portions. Dust your hands and work surface lightly with flour, and roll each portion of dough into a ball. Flatten into discs about 1/8-inch thick, and place on parchment-lined baking sheets. Place about a teaspoon of blackberry ginger filling in the center of each disc, cover lightly with plastic wrap, and allow to rise for one hour. Preheat the oven to 400 degrees F, and brush the exposed pastry with egg wash.
Sprinkle with sliced almonds, and bake for 15 minutes, or until golden brown and puffed. Cool completely and drizzle with Vanilla Bean Glaze. Stir the powdered sugar, vanilla bean paste, and milk together until smooth. Find the dough recipe here: Homemade Danish Dough. Aw, thank you! Yep it feels like I’m chasing my tail a lot of the time, but then I talk to other parents who are even doing so much more! But I am looking forward to the summer and things slowing down a bit with the extracurricular stuff 😛 Thanks Erin! I’d have felt just about the same as you on that pond field trip! This week has been busy for me to – so glad it’s Friday! I wish I had one of these blackberry danish to start my morning. Beautiful photos! Thanks Kristine! And boy I’m glad I’m not the only sissy! Haha! Allie, you don’t need to sell me on the filling. . it’s gorgeous!!! and blackberry ginger anything?!!! LOVE!!!! hope you guys have a great weekend!!! I love that they went to a local pond. . I was just listening to something on NPR yesterday talking about how more and more kindergarten classes have “nature” trips once a month where they actually have class outside for the entire day!! Kids can learn so much from being outside and exploring and I’m sure the kids had a blast fishing! anyway, it was so cool to hear what other schools in different states are doing!!! have a great weekend!! That is so cool Alice! My kids don’t do it every month but they do have more than one field trip per school year. Which is more than I can remember having! Plus they have a few other outdoorsy things throughout the year, like field days and fundraising walks. It’s great that they get to breathe some fresh air and stretch their legs every once in a while! Thanks so much for the sweet compliments dear! These are absolute gorgeous, Allie, and that filling sounds so delicious! I know I could eat it with a spoon. 🙂 Sounds like you had a fun fishing trip…haha and I’ve been hearing lots of stories about that s’mores frap! I’m almost afraid to try it. Have a great weekend! I was hearing the stories too Marcie! I just had to see for myself. I will tell you- it’s delicious, but SO SUGARY SWEET! And I am a desserts person. I enjoyed it but honestly I would have liked it even better had it been a little less sweet. Thanks hon! Stunning! Super creative flavors and if it’s the best thing you’ve tasted in awhile, I’m sold! Haha yes! The ginger really added something unique. Thanks so much Kathleen! Hope you’re having a great week so far! Anything with ginger in I’m a fan of and these are stunning danishes. I have to try this recipe. Ginger is so good, right? I love what it does in both sweet and savory dishes, and it was really something special with the blackberries. Thanks so much Janette! Thank you so much! I really loved the flavors! So summery 🙂 Hope you’re having a great one, Annie! Allie, these are just so pretty, and I love the filling. Ginger and blackberries is something I’ve never tried, but it sounds pretty darn amazing! Your son’s field trip sounds like so much fun! I’m also a complete wimp when it comes to slimy, squirmy things. I have two girls, and they LOVE being out in nature (bugs, dirt, and all), so I’ve had to toughen up 🙂 I hope you and your family have a relaxing weekend! Oh gosh! I have no plans to toughen up, honestly! I’m so over it haha! Perfectly content to embrace the sissy I truly am. Thank you so much sweetie! Hope your week is off to a good start! I would love a s’mores frap and one of these danishes right now! Now that would really be something! Thanks so much for stopping by Beth! Wow, these look absolutely perfect – the blackberry+ginger combination has my mouth watering something crazy! If you weren’t already so busy (how do you do it all?! ), I’d suggest you open a bakery! Haha right??! Gosh I think I’d have to check myself into the looney bin! Thanks so much CakePants- hope you’re having a great week so far! It is!!! I couldn’t get over how tasty they were together. I hope you get a chance to try it out Mel! Oh gosh! I remember those days and that is crazier by far. I loved when mine were that little, but I’m also really glad they’re bigger now and more independent. You’re a rockstar girl! Oh my gosh! That is a really funny story! I would have been crying too for sure. Honestly I got freaked out just by the thought of killing the worm. But it sounds like your fish’s time was definitely up. 😉 Hope your weekend was awesome! These are so gorgeous, Allie! Love that blackberry filling, I could eat that up by the spoonful! Hope you get some time this weekend to catch up on some rest! 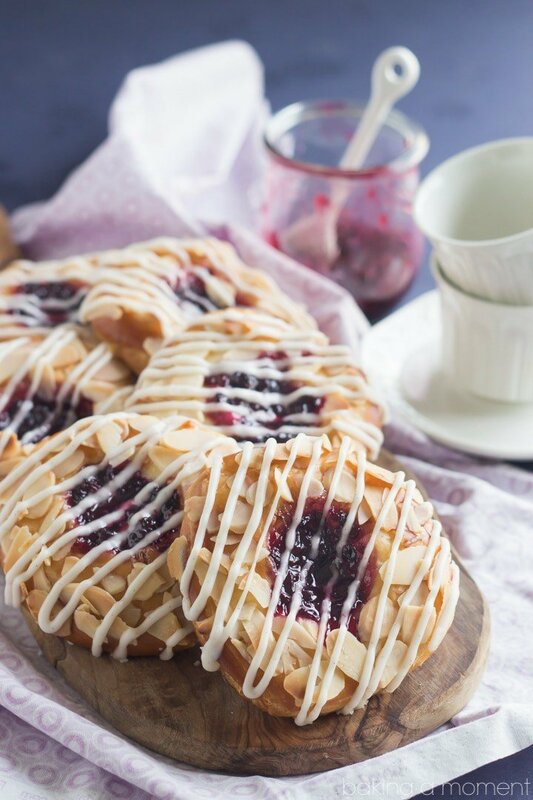 Love blackberries and these danishes look amazing! Have a great weekend Allie! These bad boys look irresistible! And blackberry and ginger? Wowza, I’ll have to tuck that away in my memory for future reference! Oh yeah! It’s a great combo. I was actually surprised by how delicious it was 😉 Thanks so much Nicole! You’re welcome! By the way, after you mentioned it I tried out that s’mores frappuccino – omg, amazing! I know what my new summer drink is! It’s really something, isn’t it!? You wrote all that in 10 min?! You rockstar! My 10 min posts are like, ‘hey guys, this is good, make it, kbye’ Love the ginger and blackberry combo, I haven’t seen that before and boy, does it sound GOOD. Haha yeah I can really run at the mouth! Or rather, the keyboard 😛 Thanks Mary Frances! LOVE the blackberry and ginger combination, super unique! I was so excited to see what you were going to do with the Danish pastry recipe and you did NOT disappoint. These look amazing, pinning! Oh em gee! Absolutely adore danishes, like, with a passion! I’ve been meaning to do some myself. Now I have absolutely zero excuses. I’ve never tried making danishes before, but they’re always the first treat I reach for if I see them out. Love all the sweet glaze drizzled over top. Yum! They always were for me too Kristen! I’m so glad I finally tried making my own. Thanks so much for the sweet comment! These look professional, and I’ll bet they taste better than most professional pastries. When are you going to open your bakery!?! Allie these look perfect! I am thinking they look even better than the pastries at Cake!! And bravo!! A fishing class trip, little league, homework, baths AND an awesome post!! Thanks so much Samina! I’m sure the s’mores frap is on it’s way to you- it’s making a big splash here! Oh wow! Really? That is so awesome thank you so much Hannah! You did really great with your 10 minutes here, Allie! And, oh my goodness, these look just peeerrrrfect! Such a beautiful combination of flavours you’ve used. I have a feeling eating one of these would be the highlight of my week! Those danish look so amazingly good and I love the ginger in them! Thanks Kevin! The ginger was my favorite part. So happy you like Sheena! Have fun and enjoy! 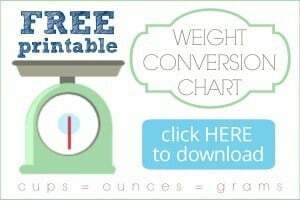 How much if using fresh ginger? Hey Debbi! I actually did use fresh ginger- I would definitely stick to the amount I’ve stated in the recipe card. Good luck, thanks for reading, and enjoy! Oops- sorry! I was thinking of another recipe there. For fresh ginger I would probably do around 2-3 teaspoons, then give it a taste to see if it’s ginger-y enough for ya. Thanks for the great question and sorry for the confusion. I am very hesitant to make any dough myself. I’m not what you would call a baker. I tried the pastry dough and it turned out pretty good although it looked nothing like yours. The dough was not sticky at all after the initial mix of wet ingredients so I added a splash more water. Also I am kneading by hand so I had to find a YouTube video on kneading. I had no idea how long to knead so I I’m not sure if I did it enough or too much. When I rolled it out, I couldn’t get it in to a nice rectangular shape. But I carried on and folded the butter in. When I rolled it again, I must have pressed too hard or rolled too thin because the butter layers came through and it made a HUGE mess. I just kept sprinkling flour to combat the mess lol. All in all, it tastes good and I can definitely see the layers, but can you give me some tips for kneading by hand and what texture it should have before I roll it out? Hey Kellie! So sorry you had trouble. This recipe would be a bit of a challenge, even for a pretty experienced baker. One thing to keep in mind going forward is, the dough should feel stretchy. You get that with lots of kneading. I just recently make a brioche recipe that kneaded for a good 20 minutes! The longer you knead the stretchier it will be, and that will prevent the butter from seeping through the thin layers of dough. If the dough is too sticky that could make it harder too, so be sure to dust your work surface (and the dough) with flour every so often. I hope that’s helpful! Better luck with the next batch!